American Girl's New 2010 Girl Of The Year Inspires Kids To Connect With Nature Through Outdoor Play | Mattel Inc.
Middleton, WI-January 1, 2010: Has childhood play officially moved indoors? Convincing research shows that today's children spend less time playing outdoors than any previous generation, leading to inactivity and increases in childhood obesity, attention deficit disorders, and even depression. To help reverse these trends and encourage girls to get outdoors, American Girl® is proud to introduce Lanie™, the 2010 Girl of the Year®, a thoughtful, energetic girl who discovers the world in her own backyard. 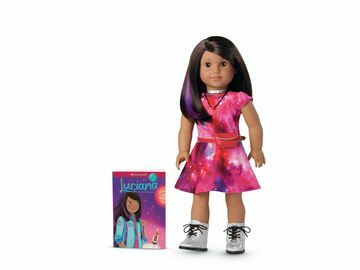 Available for only one year, Lanie will launch with two books that tell her story, a golden-haired 18-inch Lanie doll, and an array of fun accessories. To further inspire girls, American Girl is introducing Lanie's Backyard Photo Contest, free classroom curriculum materials, and a partnership with the National Wildlife Federation® (NWF), a national nonprofit that has more than 70 years of experience fostering a connection to nature in Americans of all ages. American Girl is supporting National Wildlife Federation's Be Out There™ (www.beoutthere.org) campaign, which by connecting families to the outdoors aims to help them raise healthier, happier kids and encourage a life-long appreciation of nature. This year's Lanie-inspired nature tees for girls and dolls is American Girl's way of supporting NWF's mission to inspire kids to view the outdoors as their favorite play space-where they can explore, imagine, discover, and daydream, just like Lanie. And to deepen an appreciation for nature, American Girl and NWF also created free downloadable curriculum materials for grades 3 to 5. The curriculum is designed to educate students, through fun activities and discussion, about elements of different habitats. The free curriculum materials are available at americangirl.com/girloftheyear. Written by acclaimed author Jane Kurtz, the 2010 Girl of the Year books-Lanie and Lanie's Real Adventures-introduce readers to ten-year-old Lanie Holland. Lanie loves wildlife and the outdoors, but her family prefers to do things at home-and inside. When Lanie's adventurous and outdoorsy aunt comes to stay with them, Lanie finds a kindred spirit and learns to connect with the natural world around her. Through everyday experiences-growing a garden, bird-watching, camping in her backyard, and creating a butterfly habitat-Lanie discovers how everything in nature is connected and learns there's a wide, wonderful world right outside her door. To further engage readers, a section at the back of each book includes letters from real girls who, like Lanie, are looking for ways to enjoy the outdoors. Bringing the new 2010 Girl of the Year character to life is a beautiful 18-inch Lanie doll, featuring curly blond hair and hazel eyes. Lanie's outfits and accessories consist of everything she needs for her outdoor adventures, including a gardening outfit, a set of furry wildlife friends, a hammock for lounging on summer days, and a camper and gear to explore the great outdoors. Lanie Dress Like Your Doll® outfits are also available. 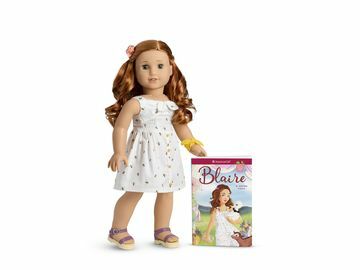 Starting on January 1, 2010, the Lanie doll, books, and accessories will be available for one year or while supplies last through American Girl's catalogue, at www.americangirl.com, and at all American Girl retail locations. To request a free American Girl catalogue, call 1-800-845-0005. National Wildlife Federation is the nation's largest conservation organization, publisher of award-winning children's magazines Ranger Rick®, Your Big Backyard®, and Wild Animal Baby®. National Wildlife Federation educates and motivates more than five million members, partners, affiliates, and supporters to seek solutions to reduce global warming, protect and restore wildlife habitat, and connect people of all ages with nature. For more information, visit www.nwf.org.